Halloween Celebration at Grant's Farm. The Halloween Celebration features fun family activities, rides through Deer Park in the dark, music provided by a DJ in the Bauernhof, and a Halloween themed show. The celebration happens after hours on nights in October, 6pm - 9pm. Entrance opens at 5:30pm and closes at 9pm. Dates are October 5th, 6th, 11th-14th, 18th-21st, and 25th-28th. Admission is included with parking. See website for more details. Grant's Farm is the ancestral home of the Busch family, of the Anheuser-Busch Brewery fame, but takes its name from President Ulysses S. Grant who had a farm on part of the property in the 1850s. His log cabin, Hardscrabble, is still on the property. Visitors can ride a tram through the 281-acre wildlife preserve or attend live animal shows featuring exotic birds and elephants. Children enjoy the petting area where they can hand-feed and pet the farm's pygmy goats. Visitors also enjoy sitting in the lovely courtyard of the beautiful 19th century Bauernhof where they can purchase soft drinks, bratwursts, pretzels and, of course, a variety of Budweiser beers! 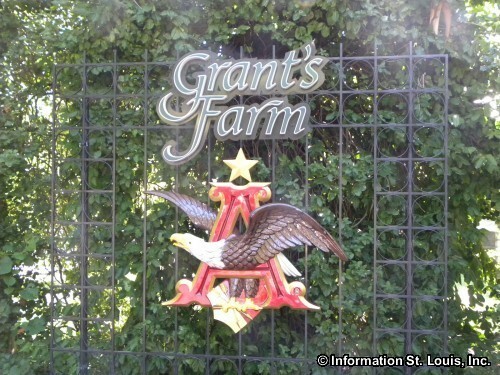 Directions: The entrance and parking lot for Grant's Farm is located off of Gravois Road, on Grant Road. Grant Road can be accessed from Gravois Road and from Watson Road, east of Lindbergh Road and west of Rock Hill Road in Grantwood Village, Missouri.